What is that red spot on my eye? Many patients will report visualizing a bright red spot on the white part of their eye when they look in the mirror. Some patients state that family or friends noticed this problem and they were unaware of it. This is typically known as a subconjunctival hemorrhage. We need to think of this condition like a broken blood vessel. The blood gets trapped between the outer conjunctival membrane and the sclera (white part of the eye). There typically is no pain, irritation or change in vision. It usually occurs in one eye but patients can present with hemorrhage in both eyes. What causes this hemorrhage? It can occur from activities associated with straining such as coughing, vomiting, sneezing or lifting something heavy just to name a few stressful activities. Occasionally, uncontrolled hypertension or diabetes can be associated. Some patients on blood thinners (Coumadin) or aspirin products may be more prone. It is often worthwhile to have an initial eye exam to rule out some of these causes. The condition is self limiting and the blood or heme will absorb on its own. Occasionally, we may treat with artificial tears if the patient has any irritation which can occur in larger hemorrhages which are more swollen or elevated. 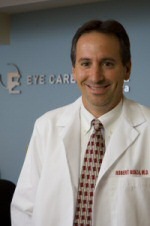 Overall, vision is not threatened and patients do very well. Interestingly, the condition often has a serious appearance but probably is one of the more minor problems we see in the office. Remember, protect those eyes! !